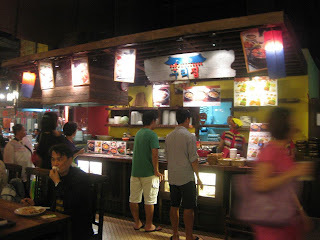 When I visited Singapore last November 2011, I had the chance to explore my adventurous taste buds. I am not a picky eater and I think a travel will not be complete without food trip. I decided to try different kinds of food during my trip. 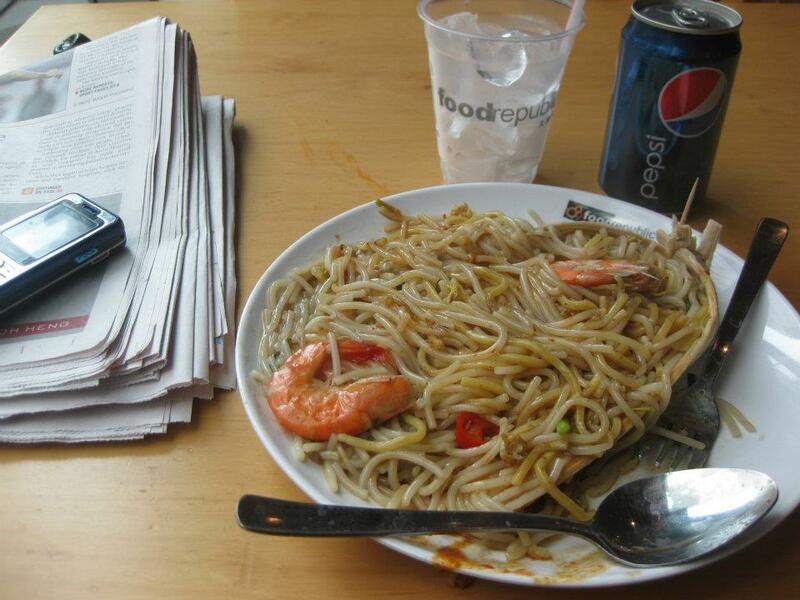 On my first day, I was accompanied by my friends, Melody and Cynthia to try their favorite fried prawn noodles. I didn't hesitate at all because they worked in Singapore for almost two years and I believe their choice of food is great. 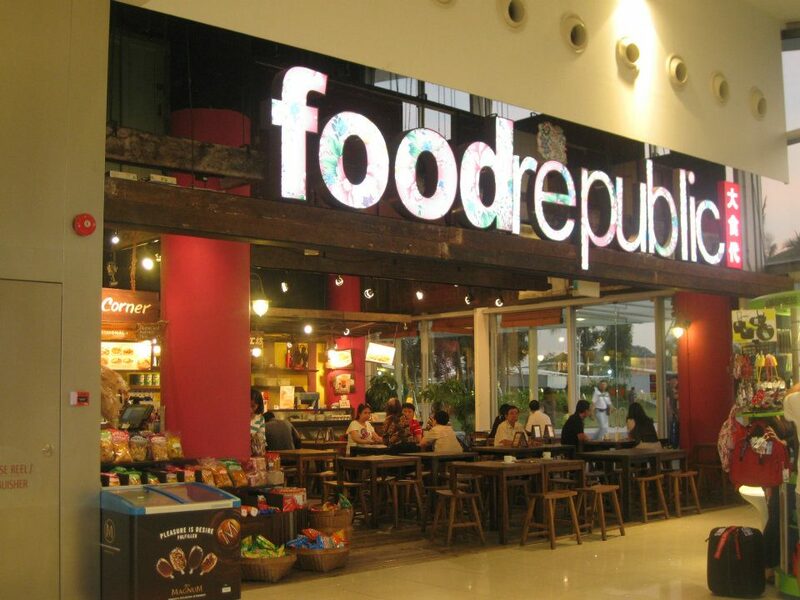 We went to Food Republic at Wisma Atria. It is located at the topmost level of the mall. When we arrived there, the place was already full with yuppies and some locals who were very hungry just like us. 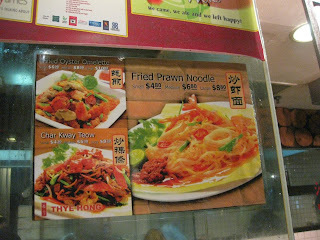 Melody ordered Hookien Mee(Fried Prawn Noodle) in one of the stalls in Food Republic. I am a bit dismayed when I learned that we will only eat noodles and no rice. No rice? I felt that I will never be satisfied with the lunch I am going to eat. Much to my surprise, I liked it so much. I didn't even looked for my favorite rice while eating it. I can even imagine the flavor of the noodle while I am writing this. The shrimps are juicy and very fresh. The noodles are cooked very well and very tender. It is best to eat it with chili paste to neutralize the oily taste. 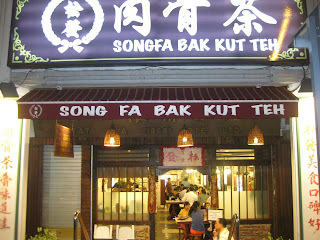 On my second night in Singapore, Cynthia mentioned that I should try the Bak Kut Teh near my backpacker's inn. 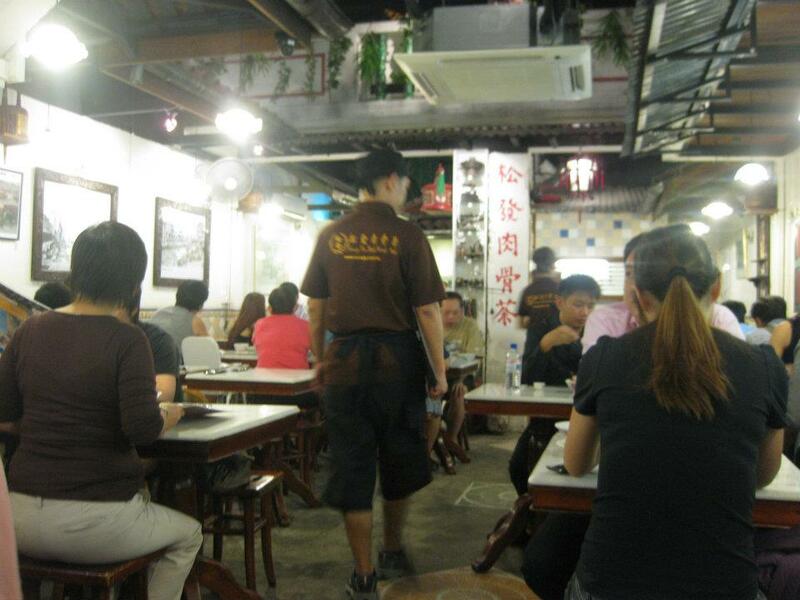 The restaurant looks old but Cynthia swears that their Bak Kut Teh tastes so good. I am not really quite impressed with the name though but knowing Cynthia, I think she is telling the truth.hehehehe. *peace Cynth! 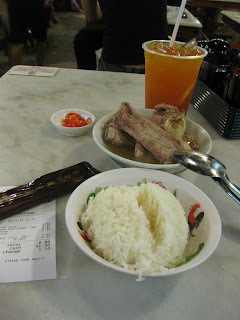 * So, I decided to roam around Singapore and then starved myself so that I can relish the famous Bak Kut Teh. The place looks like a movie set from an old Chinese movie but many locals came to eat dinner. (TIP: You should go to the restaurant early because the restaurant gets packed with locals and yuppies during dinner time.) I seated myself in a comfortable spot and slowly many people came inside the restaurant. Just when I finished my order, the restaurant is already full and some people are waiting outside. 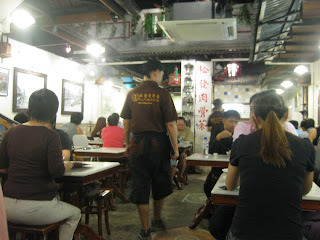 A few minutes later, the Bak Kut Teh, a bowl of rice and ice lemon tea came. Okay, see that little black stick beside the rice? It's a wet tissue. Hahahaha funny because I thought it was free but when I saw my bill it was sold separately. Waaaahhh...No wonder my bill reached SGD 8.80. My stomach was so happy that night and even though I went out of my budget(My budget per meal in Singapore is SGD5.00), I wasn't disappointed. I definitely recommend this meal. I also learned they have lots of branches in Singapore. Just mention Bak Kut Teh and surely uncle and auntie will help you around. My next stop the following day(my last night in Singapore) is Vivo City. It is the drop off point for Sentosa Island and Universal Studios. I always go out sightseeing in the afternoon to avoid the crowd in the train station and it is cooler in the afternoon. I checked out Vivo City and saw many branded shops in the mall. Again, I walked around the mall and I want to feel tired so that I can indulge after. 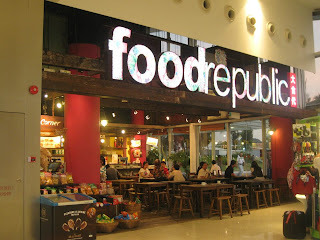 I was delighted to see that Food Republic has a branch in Vivo City. I didn't waste my time and went around the place to see what I can eat. Now, I asked the Filipina girl to at least add a little rice to my order (Hahaha, my Filipino appetite gave in and I felt hungry that time too!) and she said YES. Yehey!! Unfortunately, her companion, gave me the different bowl of Korean mixed rice. She protested but I said it's all right. Epic fail! 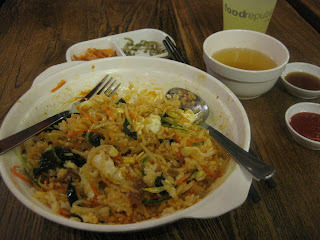 It has kimchi and pickled bean sprouts side dishes and a little soup. To eat the Korean mix rice, you should mix it all so that the flavors of the food will come out. You can put a little chili paste if you want it a little hot. 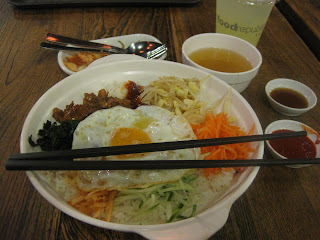 Now, it's time to indulge in Korean mix rice and my gosh, it taste so good. I still crave for it until now but too bad-it's in Singapore. Cham madineyo as the Koreans would it. The rice is not very sticky though and I didn't use chopsticks. It is delicious and the serving of the rice is just enough to make you very full after eating. (Good thing, they gave me the wrong bowl because I could have end up with a painful stomach due to excessive rice intake.) Bwahahaha. My food adventure in my trip to Singapore was very memorable. The bad side is, I like all the food I ate that it would probably take another 48 years to eat that meal again. Hahahaha. Singapore is just a plane away but it needs some ample budget and planning to go there again. I'll never forget my first out of the country food adventure. 'Till my next food adventure pips!!Ciao! !